Gelbvieh (say gelp-fee) originated in Bavaria, in southern Germany in the late 18th and early 19th century. They were first imported into the US in 1971. The classic color is yellow, but some are reddish or black, with light skin pigmentation and short horns. 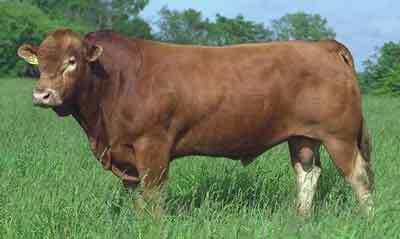 Polled cattle have developed in the United States from the use of naturally hornless foundation females. Gelbvieh calves are widely recognized for excellence in growth, feedlot efficiency, muscling and marketability, while Gelbvieh females are known for milking ability, fertility and quiet temperament. According to the USDA Meat Animal Research Center's (MARC) Germ Plasm Evaluation. Gelbvieh is the only widely used breed that excels in calving ease, milk yield, retail yield, weaning growth, and yearling growth combined. Gelbvieh produce more pounds of weaned calf per cow exposed than any other widely used breed. Gelbvieh fit well as the crossbreeding component on British and Brahman-based cows.